The others had left me at the conclusion of the weekend, needing to get home for work and other duties. Iris and Scott would be back to join me the next weekend along with others to help celebrate my birthday with more desert peakbagging. I was on my own for the next three days and had an agenda that could be managed without the help of a high-clearance vehicle. 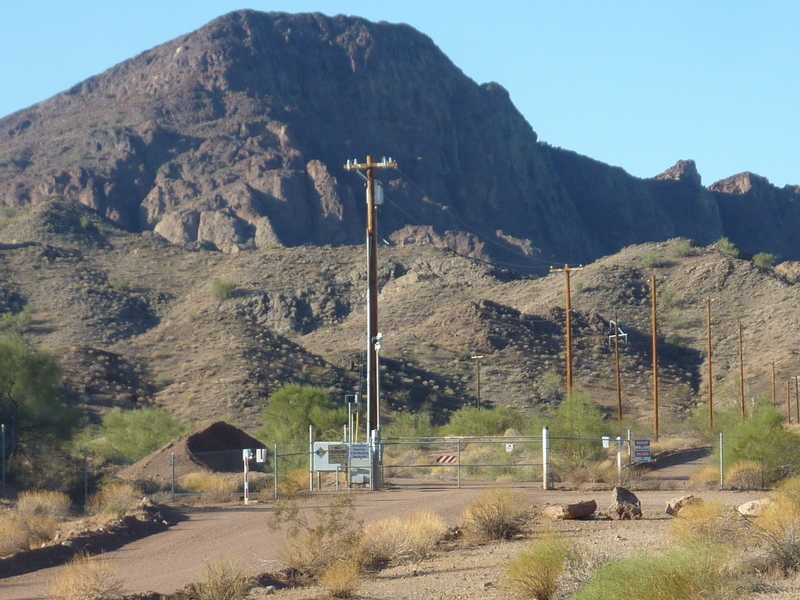 After spending the night at an Open OHV area off SR62, I drove out towards Parker Dam to tackle a handful of summits in the Monument Mountains, a sub-range on the east side of the Whipple Mtns, adjacent to the Colorado River. This area has some of the best scrambling to be found in the California desert, all on mostly-good volcanic rock, unusually. Following three warm days with only modest breezes, strong winds started up during the night, rocking the van gently while I slept and keeping up all day while I hiked. The winds would add some challenge to the stiff class 3 scrambling on these volcanic peaks, but this was more than compensated by cooler temps that hovered around 60F. Unofficially named Copper Basin Peak rises to the east above the reservoir by the same name. LA MWD's Colorado River Aqueduct begins at the Whitset Intake where it is pumped 300ft up from the river to the Gene Wash Reservoir and from there it is pumped another 275ft up to Copper Basin Reservoir before flowing through the Whipple Mtns Tunnel. Most of the lands around the two reservoirs and along the aqueduct route is jealously owned by the Metropolitan Water District and not open to the public. These two summits require some stealth, but if not on the service road leading to Bandit Pass there is little chance of discovery. I parked outside the gate across this road, starting early around 6a, before sunrise. I followed the service road for about 2/3mi before turning left and following a wash towards the summit. Like almost all of the peaks in this area, routes are not trivial as there are impressive volcanic cliffs around most sides. The crux on the route I followed from the northeast was a slanting class 3 groove that breaks through the cliff band, above which the route becomes class 2. There is a fine view of the Copper Basin Reservoir from the summit, with the other reservoir and the Colorado River visible far to the east. There is also a good view of the impossible-looking Monument Peak to the west, above the reservoir. Less than half a mile to the southeast is Peak 2,020ft, a fairly easy traverse involving a drop of less than 300ft. In descending off this bonus peak, I dropped into a different drainage than the one I'd used for the ascent. It has the advantage of being more discreet than following the service road, and offers a class 2 route to both summits. A couple of wild burros watched me as I decended through the drainage, not looking too bothered by my presence. I also found one of the three saguaro cacti I saw during the day. I spent less than 2.5hrs covering the 4.5mi loop with 1,300ft of gain. The next three peaks were all located off paved Black Meadow Rd, none more than a mile from the road, but all challenging and fun. With 750ft of prominence, Peak 1,990ft has sheer walls surrounding the summit on three sides. A steep gully up the northwest side goes class 2-3. The lower part of the mountain is littered with rock and boulder, becoming more solid towards the top. I climbed a stiff class 3 wall on the left side of the gully on the ascent but took the easier class 2 route on the descent. Peak 1,540ft is 400ft lower about 3/4mi to the southeast and looks impressive. Because of the long drop to reach it, I decided to make it a separate effort via an easier route. Even more impressive is the higher Peak 2,056ft to the east, a P900 I had climbed two years earlier on my first visit to the area. This summit is very imposing from the south. It turns out the upper half isn't as hard as it looks. The crux is choosing which of two routes to take after reaching the halfway point. I chose the right (east) gap on the ascent which turned out to be a surprisingly fun chute with a short bit of steep class 4 scrambling to bypass a large chockstone. After some chossy traversing across the west side of the summit ridgeline, there was some good class 3 scrambling on mostly solid rock to the summit. On the return I took the alternate (west) route to bypass the class 4 section, finding it easier class 2-3. This was the most challenging peak of the day, a really good one. I used the same starting point as I'd used for Peak 2,056ft two years earlier, following a good burro trail for about 2/3mi up a drainage to the south from the pavement. At a low saddle the peak comes into view. Lesser burro trails lead across the grain of the adjacent drainage to the base of the peak, with a chossy climb up to the west side of the peak where the real work begins. The trick is to explore around the corner to the right to find the class 3 access to the more solid rock above. Careful route-finding keeps it to class 3 and I found myself going slowly and deliberately in several places due to exposure. Great fun. Views aren't as spectacular from the summit since it is surrounded by h igher peaks on three sides. I found an empty tortoise shell on my way back. It had a hole the size of a silver dollar where it appears a predator pecked through the hard outer shell. This was a bit surprising since it was a good-sized tortoise - these usually have harder shells to crack than the younger versions.